November 26, 2018 — Besides alternative medicine such as yoga and meditation, or using energy healers, tarot guides, or curanderas, sometimes we need the help of Western medication or talk therapy as well. It can be hard for those who identify as LGBTQ+ or POC (myself included) to find a therapist that they connect with and trust, because if the therapist doesn’t have experiences being LGBTQ+ or POC themselves, they might not understand our community’s needs, or have cultural biases, assumptions, or discriminatory thoughts. Having therapist directories such as Latinx Therapy, Therapy for Latinx, Therapy for Black Girls, and National Queer & Trans Therapists of Color Network that are culturally specific allows us to pick from therapists who see our identities not as problems, but as strengths. For the holiday season, I decided to try out those four different culturally specific therapist directories, and one that is generic called Psychology Today, to compare them to each other in terms of which is the most user friendly in assisting LGBTQ+ and POC in finding a therapist. The things I looked for most were the ease to search for specific things such as specialties, insurance, zip code and radius, session rates, as well as if they allow reviews of their therapists. 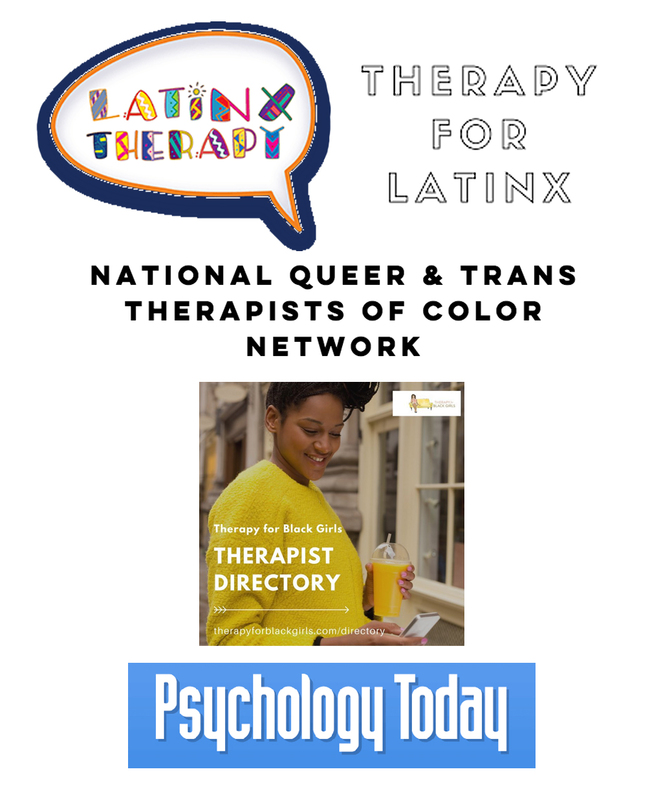 Below are my reviews of Psychology Today, Latinx Therapy, Therapy for Latinx, Therapy for Black Girls, and National Queer & Trans Therapists of Color Network directories. 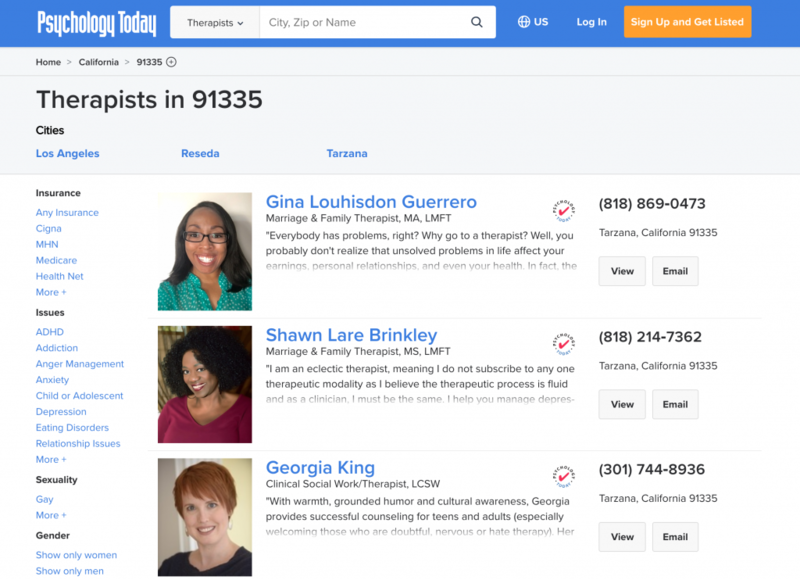 Very User Friendly = The easiest to search for therapists. Moderately User Friendly = Less easy to search for therapists. Minimally User Friendly = Difficult to search for therapists. Click here to see the criterion scale I used to rate and review each one. I am currently still trying out these directories myself, and have discovered that on Psychology Today, for some therapists that are listed as taking a specific insurance, when I called them they said they don’t take that insurance. I’m not sure if this is an issue of the therapist not updating their Psychology Today profile, or a malfunction in Psychology Today’s site. See the end of this article where it says “Closing Notes” for more updates on difficulties I’ve faced in using the directories and finding a therapist. They also have a “get help” section where they explain different mental health realities, a magazine, and news. Free to find a therapist. It costs therapists $29.95 per month to join. Search Options are the options you select to find a therapist that is a good match for you, and that is in your area. 61 options including Art Therapy, Biofeedback, Culturally Sensitive, Dance/Movement Therapy, Expressive Arts, Feminist, Mindfulness Based, Somatic, Trauma Focused, and Online option. The option to pick multiple different search options is harder on mobile, and harder to find. It is the “Refine” button in the top right hand corner, but it is annoying to do it on mobile even when you click “Refine” because it refreshes after each choice instead of waiting for you to select all the choices first. Plus their specialties and any other info that Psychology Today lists in the search engine. Ex. Specialties, Issues, Mental Health, Client Focus (Age, Ethnicity), Treatment Approach – Types of Therapy, Modality. I think it would be helpful if people could leave reviews so others know if that therapist wasn’t culturally competent or trauma-informed, or made them feel uncomfortable in any way. Also, the sexuality and gender categories should have more options for those who identify as non-binary. Would be helpful to include cultural specific issues – such as ones that Latinx Therapy including Family Separation / Conflict, Immigration, Cultural Oppression, First Generation Professional Issues, Incarceration/Re-entry, English-Speaking Anxiety – and to offer the option of “Do not accept any insurance. Superbill option” like Latinx Therapy offers for insurance. It would be useful to have the option to pick a therapist by ethnicity. As mentioned prior, the mobile version of the site should be changed to make it easier to search for multiple options. I think switching the search option called “issues” to “specialties” would be beneficial because instead of saying, these are the client’s issues, it’s saying, these are the therapist’s specialties. In that way, it rids of placing blame on the person struggling, and also does not label their realities as problems. **Definition of Superbill: a form from your insurance that you submit for reimbursement. I love that it gives so many initial search engine options! Especially for the insurance, that can be so difficult to find a match. When I searched for myself, I first typed in my zip code. Then I chose “women” as preference, and wanted to choose queer or LGBTQ but they only had bi, lesbian or gay. I also wanted to choose ethnicity – Latinx specifically – but wasn’t able to choose that either, so I ended up choosing the issue I wanted to work on instead. There were 20 listings that popped up for me once I had narrowed it down to that specifically, but I wish there were more options to choose a queer or Latinx therapist. What needs work: Add option to review therapists, and more therapists in directory (though they just launched recently, so I’m hoping to see it grow xox). 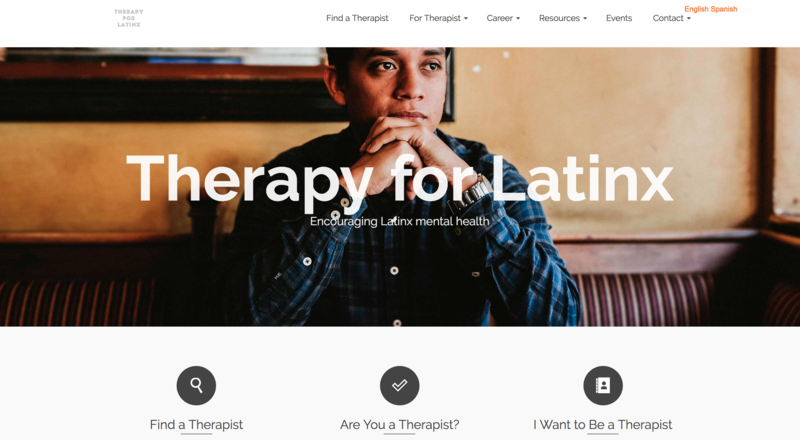 Bilingual database of Latinx therapists with the intention of helping people find help in their language and budget. They just recently launched this year and are still in the process of adding more therapists to their directory. 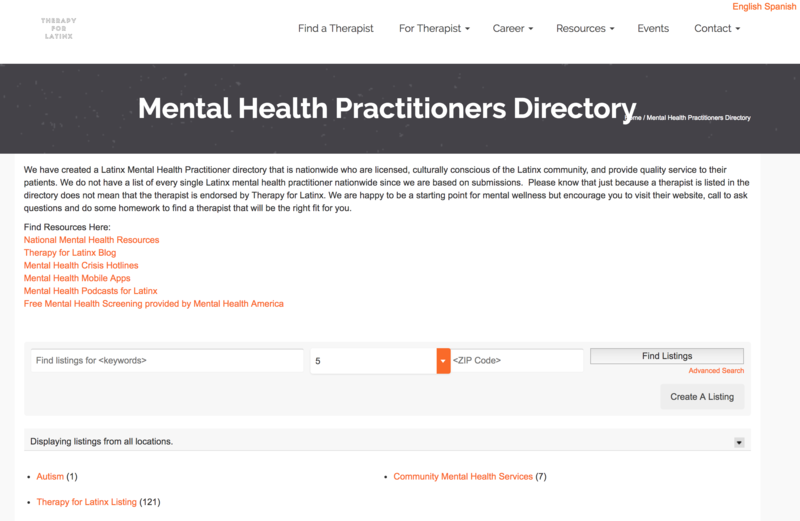 They also offer resources (Bilingual Non-Profits, Mental Health Podcasts and YouTube, Mental Health Apps, Recommended Books, Mental Health Screening that directs you to Mental Health America’s Mental Health Screening, resources for professionals, and two images to download), the founder’s therapy info, Latinx Therapy podcast, and a Latinx Therapy blog page. 5 states, 19 total therapists so far (they just launched). Costs $21 per month or $181 per year for therapists to join. City or zip code and 10, 25, 50, 100 or 250 radius options. 69 options including Latinx specific ones such as Family Separation / Conflict, Immigration, Acculturation, Cultural Oppression, Legal System, First Generation Professional Issues, Incarceration/Re-entry, English-Speaking Anxiety, and Racial Identity. On mobile, when you type in the zip code on the homepage, the text goes over the magnifying glass icon that users would click on (though I was still able to click on it). However, I do like the feature on mobile for the filters (to pick specialties, ages etc. ), it works much better than Psychology Today’s mobile filter options. Contact form – I guess you can contact each therapist directly from their site. In the specialties, there a few repeats (Immigration, Acculturation, Marital & Premarital Issues, Trauma & PTSD, Tweens & Teens) that could be rid of for clarity. I’m excited to see more therapists join! Would be great if people could leave reviews. I noticed that some of the therapists in the “Rates and Insurance” part of their profile only included their rate, not the insurance they take. It would be helpful to have each therapist include the insurance they take as well so as to not waste potential clients time. I love the Latinx specific specialties: Family Separation / Conflict, Immigration, Acculturation, Cultural Oppression, Legal System, First Generation Professional Issues, Incarceration/Re-entry, English-Speaking Anxiety. Those are all categories that Psychology Today doesn’t have (they do have Family Conflict, but not Family Separation). Both Psychology Today and Latinx Therapy gives the Racial Identity option. I also like that it gives the “superbill option” for out of network. That’s super important to know !! (no pun intended…). Psychology Today does not offer that option. Lastly, I love that Latinx Therapy calls it “specialties” instead of “issues,” like how Psychology Today calls them. When I tried to find a therapist for myself on this site, once I typed in my zip code, there was a lot less insurance options. At first I thought this was an error in the website coding, but then I realized the site shows only the specific options that therapists in that area have said they offer, which I think is awesome and efficient! With the zip code I used, my insurance is currently not covered by any therapists in the Latinx Therapy directory (yet). I did find one that accepts superbill, and another that does sliding scale, however I’m not sure how low their sliding scale actually is because another therapist on this directory that I contacted who was also “sliding scale” said the lowest they can go is $90, which I can’t afford. I was also confused by the PPO-Out of Network option, because my insurance is United Healthcare PPO…I found out fast that the PPO-Out of Network option didn’t apply to my insurance (I called a therapist and she let me know she doesn’t accept my insurance lol). 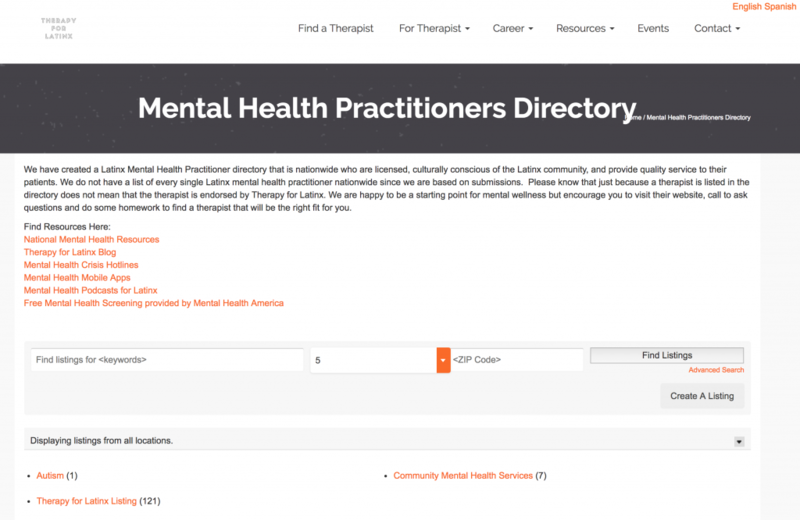 I think the more this directory grows, the more it will be able to help people because there will be increased options for therapists to choose from in different areas. What stands out: Only one to allow ratings of therapists. 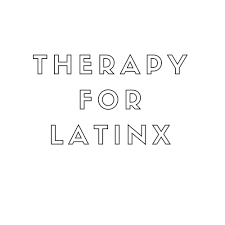 “We have created a Latinx Mental Health Practitioner directory that is nationwide who are licensed, culturally conscious of the Latinx community, and provide quality service to their patients.” – Therapy for Latinx. They also offer a blog, podcasts, mental health hotlines, apps, links to other resources and organizations, therapist job postings, professional organizations, professional events, and community / other healing events. Free to search for a therapist. It was initially free for therapists to join, and is now $15 per month or $120 yearly price. Zip code and radius of 1, 5, 10, 20, 30, 40, 50. **The only other option that they offer initially are typing in “Keywords” of your choice. When I used the search engine, it led to a confusing page that said “Find a listing,” and yet the questions it asks sounds like it’s asking a therapist who is trying to join the directory. For example, it asks for “First and Last Name” and yet shows the keyword I had inputted there, “Contact Phone Number for Patients,” “License Type and Number,” “Short Bio,” etc. I tried searching again without a keyword, and I did find many therapists in my area at 10 and 20 mile radiuses. I think if they can fix that section of the site and allow options to select from including city/zip code, insurance, and specialties (including culturally specific ones like Latinx Therapy has such as Family Separation / Conflict, Immigration, Cultural Oppression, First Generation Professional Issues, Incarceration/Re-entry, English-Speaking Anxiety) vs. using keywords, that would be much more helpful and easier to navigate. 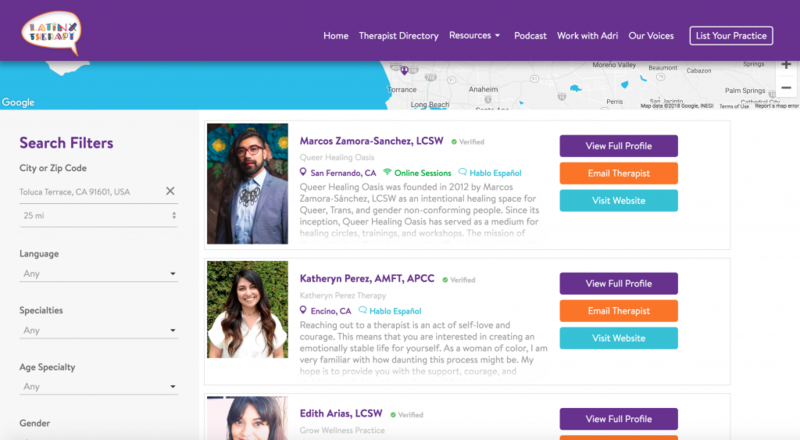 I love that they’re partnered with Mental Health America and that the cost for therapists to join is lower than PsychologyToday and Latinx Therapy. I also love that it includes the benefits therapists will receive from being on that directory including how many clicks their site receives per month currently. The option to choose a one mile radius is very important to me because some people don’t have a car or reliable and safe bus transportation. Lastly, the option to review each therapist IS SO IMPORTANT !!! It’s crucial to hold all people accountable, even in the Latinx community. LOVEEEE that aspect so so so much. For this one I put my experience using it in the “what we feel is missing / should be changed” section. What stands out: Has over 300 therapists. Therapy for black women and girls. 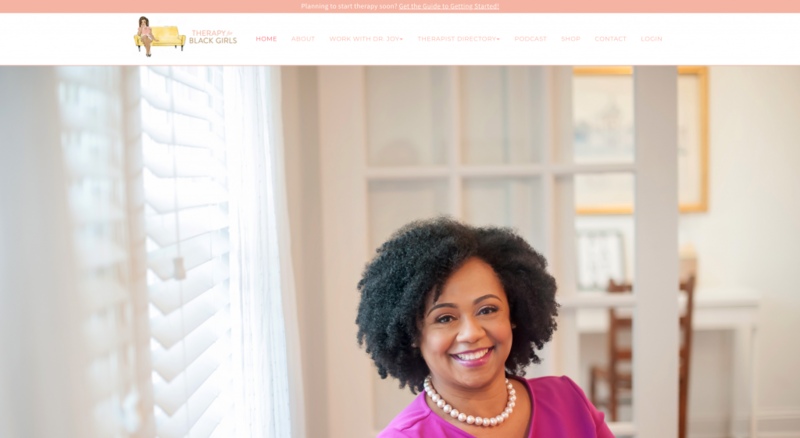 They also offer Therapy for Black Girls podcast, The Yellow Couch Collective (a space for black girls to support, encourage, and learn from one another), and merch. Costs therapists $15 a month to join. Click on your state, and then you get a list of therapists in your state. Each profile initially shows: photo, name, address, site, number. More options to search for a therapist including city/zip code, insurance, and specialties (including culturally specific ones like Latinx Therapy has such as Family Separation / Conflict, Immigration, Cultural Oppression, First Generation Professional Issues, Incarceration/Re-entry, English-Speaking Anxiety) would make it more user friendly. Also, it would be helpful to have more information about each therapist in their profiles including the rates they charge and insurance they accept. The ability to leave reviews would be lovely too. It’s so impressive how many therapists are in this specific directory! I’m excited to see it grow more. Also, I love that it only costs $15 for a therapist to join, the same as Therapy for Latinx. I felt stressed out when I got to the listings in my state because there were so many, and I wanted a way to search for one that was close to me, without having to go through each listing. Once my anxiety calmed down (lol) it was fairly easy for me to go scroll through each listing and find many that were close to me. I found a couple of databases in specific states (Utah, Minnesota) but none that are throughout the U.S. and are reliable. I thought maybe Gaylesta was throughout, but it’s a bit confusing because they don’t list the states that they have therapists in their directory, though I did find some in California. NAMI suggests this directory, but I also didn’t find anyone close to me in that directory. 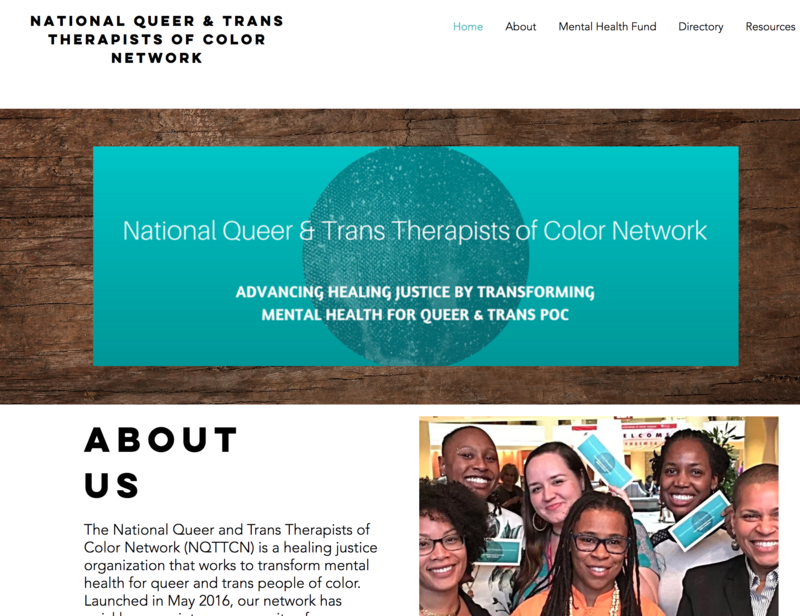 The National Queer and Trans Therapists of Color Network was another one I came across, and though easy to use, I wish it included a lot more information on each therapist, and more search options. Because this one is a national directory that is still very active, I am going to review that particular one. What stands out: Their Mental Health Fund that helps people afford a therapist. 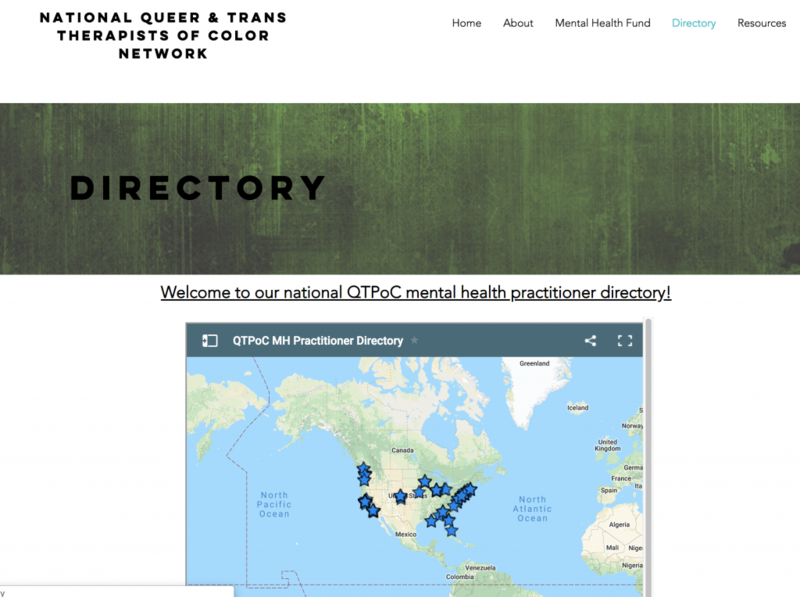 Therapist directory of queer and trans therapists of color that started in 2017. They also offer a Mental Health Fund to help people afford a therapist, and a list of other resources including hotline numbers. About 100 total (was a bit hard to keep track when counting all the stars). Free to search for therapists. 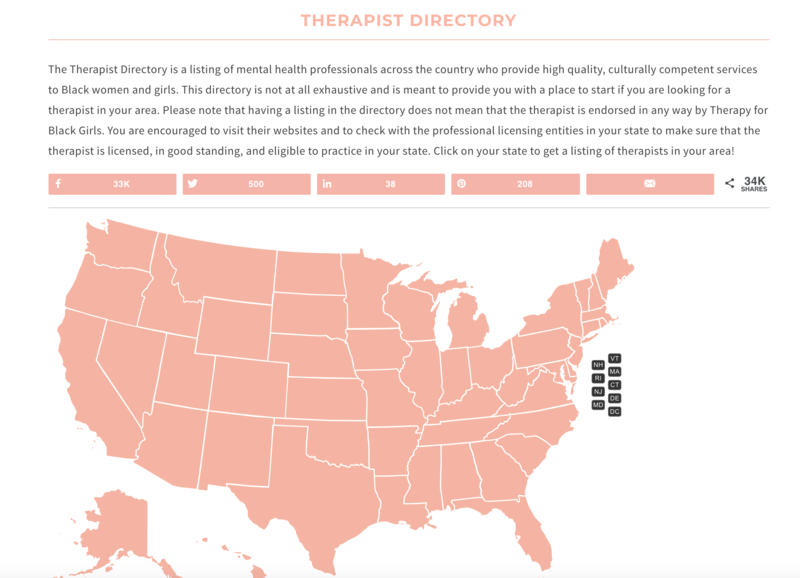 For a therapist to join the directory, it costs them $0-25 sliding scale to be on the Basic Listing (Google Maps only), and $60 for Featured Listing (Google Maps plus featured listing on their site and social media). No one is turned away for lack of funds. It is unclear if it is a one time fee, or a yearly fee. Lack of search options on Desktop and Mobile. Lack of option on homepage to click “Find a Therapist” from their directory on Desktop and Mobile. Difficulty searching for a therapist on the map on Mobile. Click “Directory” which takes you to a map with instructions. Zoom in on the map to your state and city. Then you click on one of the blue stars (or possibly the only blue star if there aren’t many in your area) to view the therapist’s info. Supervisor name & License No. They also have a different page called “Featured Therapists” where it shows the therapist’s photo with their city, state, and license name, and when you click on them it goes to their site. More search options – including culturally specific ones like Latinx Therapy has – and the ability to leave reviews. Each therapist profile should also include the insurance they take, and if they don’t take insurance but use superbill. I love the options for office accessibility and the race/ethnicity. The race/ethnicity part really caught my attention because I could only imagine my joy if I found a queer Peruvian therapist. The other directories aren’t as specific, for example, Therapy for Latinx and Latinx Therapy categories them all as Latinx. Also, I like that they say “Pronouns” vs. “Preferred Pronouns” because preferred makes it sound like the therapist can choose to not use their preferred pronouns. I loveeee that they have a whole team and advisory committee to help guide and maintain the site to further growth. Their “Agreements for NQTTCN QTPoC Mental Health Practitioners” is super radical, and their Mental Health Fund to help people afford a therapist is everythingggggg <333. It is very easy to use on Desktop, and I hope more queer and trans therapists of color register with them! I did have issues trying to use it on mobile because the map kept malfunctioning and wouldn’t let me zoom in to the area I wanted to zoom in to see. I also wish there were more search options as I mentioned prior. 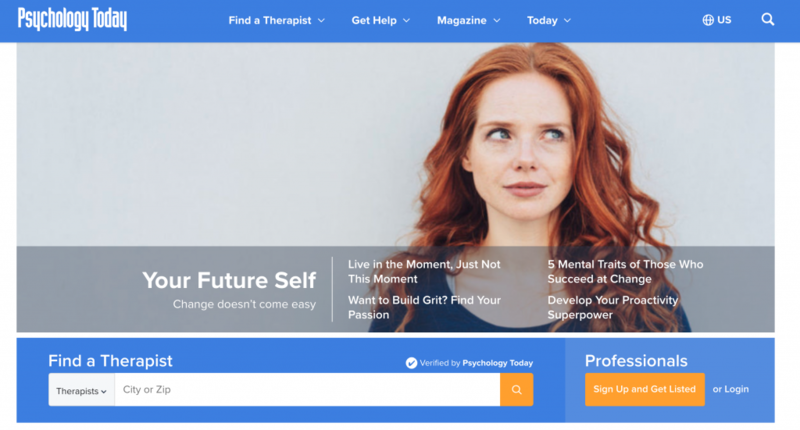 Very excited to see all of these directories increase their therapist memberships over time, and continue to update their sites to make it more user friendly. A note for all the directories I reviewed, I noticed in one of the LGBTQ directories I found – that I didn’t review – that it had the option to select female abusers, male abusers and perpetrators for domestic violence categories. This is a super helpful option, and one that all directories should consider adding. 1. Do you have experience treating people from my cultural background? 2. Do you have experience working with people with (things you’d like to work on with them). 3. How would you include aspects of my cultural identity, age, faith, gender identity or sexual orientation, in my care? A checklist for what to look for during therapy is here. It is directed to survivors of sexual trauma, but I believe it can apply to people with mind obstacles who are looking for culturally conscious and trauma-informed care as well. Also, consider researching different modalities of therapies to see which one connects with you.